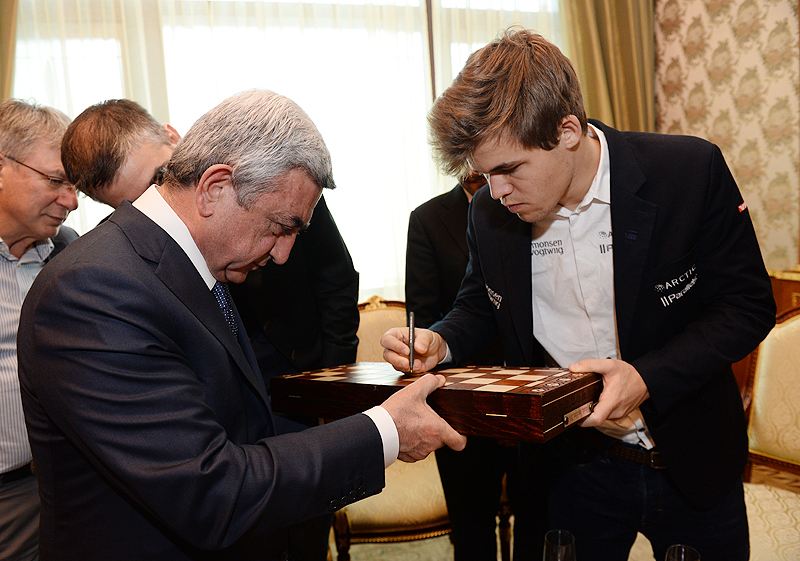 The President of Armenia and the President of the Armenian Chess Federation Serzh Sargsyan today received the Norwegian grandmaster, the number one chess player in the World Chess Federation (FIDE) rating list, reigning World Champion Magnus Carlsen and the world cup-holder, thrice Olympic chess champion, the member of the World Team Chess Champion Armenia’s national chess team, the grandmaster Levon Aronian who have arrived in Armenia at the invitation of the Armenian Development Initiatives Foundation and the company Acronis. 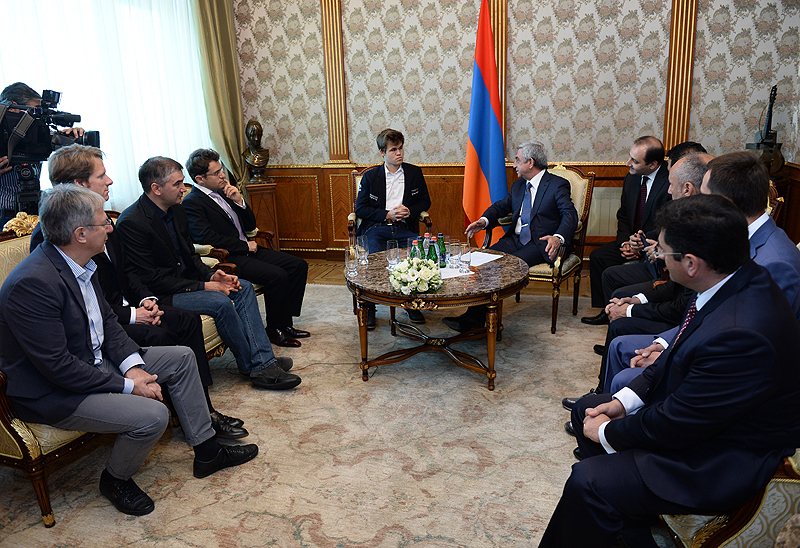 In addition, the Armenian President hosted the Chairmen of the world-famous IT companies Parallels and Acronis and the President of the Skolkovo Foundation who have visited Armenia within the framework of the same project launched by the Armenian Development Initiatives. The foundation has combined chess and information technologies in one project considering that Armenia pays close attention to the spheres already made significant progress in the country. At the meeting, the executive director of the foundation noted that the project is aimed at presenting Armenia’s successes and peculiarities to the world and creating new development opportunities for underpinning the given and a number of other promising spheres. 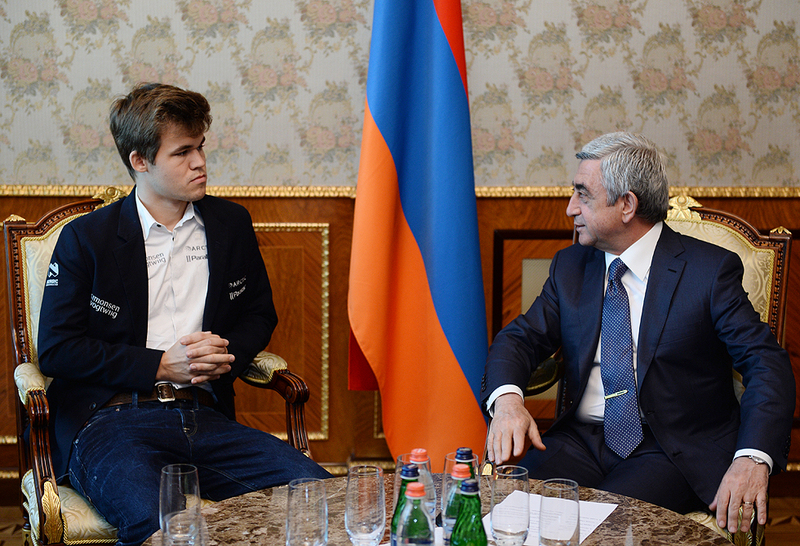 The president welcomed the guests and the foundation’s mission, stressing that he considers it a great honor to host the world’s most powerful chess player Magnus Carlsen in Armenia considering also the attitude that has formed towards chess in Armenia. “I am also glad to see Levon Aronian here. He is the pride of our people, and arguably the strongest opponent of Magnus. Indeed, we pin great hopes on Levon, and it is first of all by virtue of Levon that our national team selected from a small country has become a thrice Olympic chess champion. I am very grateful to him. Of course, I am also delighted to see people having achieved great successes in the sphere of information technologies. I think that this initiative of the Armenian Development Initiatives Foundation has hit the target once again and this is a laudable fact,” said President Serzh Sargsyan. 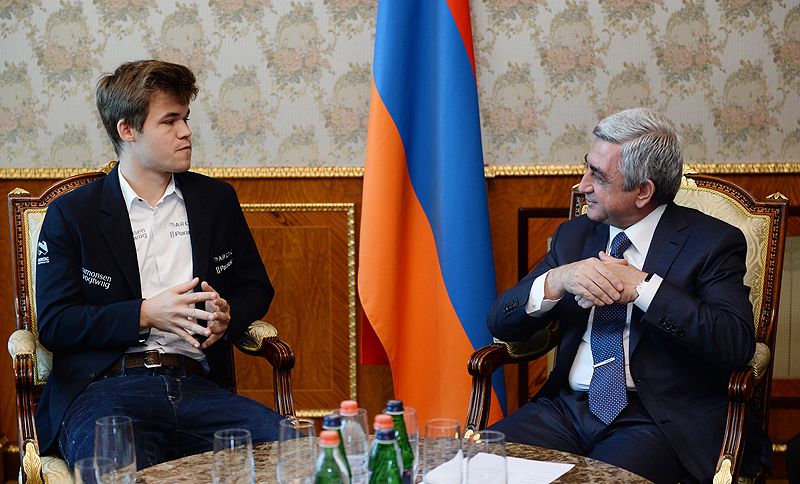 According to Magnus Carlsen, he also considers a great honor to be in Armenia - “a great chess country.” “Over the last few days in Armenia I have been witnessing the love and the enthusiasm the Armenian people feel for chess. I think that Armenia’s such approach, especially including chess in school program, sets a wonderful example to the whole world. That is a great step,” said the world chess champion. At the meeting, the interlocutors touched upon Armenia’s scientific and educational potential and the works carried out in our country to stimulate the development of chess and information technologies, as well as upon the promising development projects.